Can you find all the endings? Game is being updated, delete your current version because a better one is coming soon. Nice game you have here T Allen. Thanks! I have never really coded more than 1,000 bits of code and I predict by time the game is finished there will be about 10,000. Recent Development Log: The game is going very well.. The fights might be a little hard to code but I am getting there. 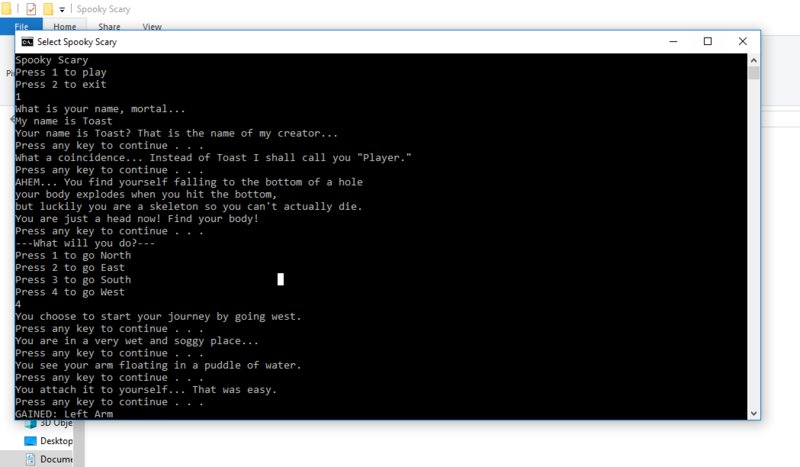 About 2,000 bits and bobs of code are in the game and its not even close to being finished! I hope you like it or else I am going to be mad about wasting time and energy. Spooky Scary's development crew (Me) has been slacking off for a while and don't really feel like coding the game. So I am going to tell you what to expect! The game will also have 8-bit Spooky Scary Skeletons playing on a loop while you try to find your body, people who have helped Toast Studios will be put into the game as Easter eggs or fights. There will be a total of 5 bosses (Ribcage, arms, and legs) that you will need to fight in order to complete the game! That is really all the info I have on the game so now I will share a screenshot. Way to hard! And instead of using arrow keys can you make it so that you look around with the mouse. Can you make a .zip version? I knew it was created by you the moment I saw how many jams it was posted on! Space Jam community · Posted in Discord link isn't working for me. Yes you can interpret it anyway you want! It just has to be non-earth. It does not seem to tell the controls, so what are they? Space Jam community · Created a new topic Is there a prize?